The Bike Helmet Blog: My Bike Helmet Saved My Life! Most people who have engaged in discussions about bicycle helmets have encountered someone claiming that a bike helmet saved either their life or the life of someone they know. Such claims can be tough to counter because they are made with evangelical conviction. I’m still at a loss with these. I can’t say, “No it didn’t.” Or, “Prove it.” Their proof is that their bicycle helmet cracked and because it cracked it saved their life. What other safety devices do people hold to such a low standard? If I life jacket tore apart and floated away as soon as you hit the water, would you claim that it saved your life? If a seat belt released upon impact, would this bring it accolades? In fact, bike helmet manufacturers brazenly admit how fragile their helmets are – if you drop your bike helmet, the warranty is void and you must replace it. They are, after all, just a bit of Styrofoam. Yet bike helmets are presented as safety shields of mythical proportion because they break apart on impact. Their manufactures must love this. They only need to test their helmets to a total impact velocity of 20 feet per second, which translates to 13.64 miles per hour (21.95 kilometers per hour). That’s about the same speed a head reaches when a person of average height falls over from a standstill. There’s no room for any additional velocity in the equation, say a motor vehicle impacting the cyclist who is standing still. And perish the thought of the cyclist actually moving! Read the Consumer Product Safety Commission’s (CPSC) own testing regulations if you don’t believe me. Think about this. If you are in a crash of any speed whatsoever and your helmet breaks apart at the initial impact, your head is not only unprotected at impact, it remains so through the rest of the crash. The low impact speed for which bike helmets are designed is troubling enough. Then consider that the tests are also limited to the top parts of the helmets, never blows to the side or back. Take a close look at the diagrams in that CPSC link to see this. I suppose if crash victims could reorient themselves during a crash to ensure they only hit the top of their head, this could be useful, at very low speeds anyway. But then consider that bike helmets must be fitted perfectly to each wearer in order to be useful at all. They come in at least eight sizes, depending on the manufacturer. Then, assuming you choose the correct size, you must spend time micro-adjusting the strap so the helmet sits just so on your head, otherwise there is no expectation for it to protect you at all. Here’s the result of a lawsuit won by a bike helmet manufacturer because the victim, an experienced cyclist, could not prove that he had adjusted the helmet straps correctly. Some bike helmet manufacturers are trying to do the right thing by developing helmets that can withstand greater impact. The results are extremely expensive helmets that usually look a lot like motorcycle helmets. Are we really going to encourage more people to ride bikes if they have to wear a motorcycle helmet? All of this still doesn’t get at the larger issue – that no helmet, not even a motorcycle helmet, can prevent brain injury. This is because there is space between our brain and our skull. Upon an impact to our head, whether our skull is wrapped or not, our brain slams against the inside of our skull. Here in the U.S., our NationalFootball League is finally having to face up to this fact. And just as the NFL has reached its limit on helmet design, bike helmet manufacturers will have to face the same facts, too. Nothing can prevent a brain from slamming into the inside of its skull. Then there is the danger of wearing a bicycle helmet – rotational brain injuries. Because bike helmets are made of soft Styrofoam or similar foam products, they compress and cause friction upon impact. If the crash victim happens to land at any angle rather than straight on, there is a high risk of severe brain damage caused by the sudden rotation at the base of the brain. Read more about rotational brain injuries caused by bike helmets in this paper. After more than a decade of researching and discussing the bicycle helmet problem I’m more than frustrated with its significant harm to bicycle advocacy efforts. I tend to get a twitchy when I’m forced to listen to an impassioned proclamation that a bit of Styrofoam saved someone’s life. I’m ready for bike helmets to be seen as what they actually are – just a bit of Styrofoam, nothing more, nothing less. If someone feels better riding their bike with a bit of Styrofoam on their head, cool, go for it. But please, let’s stop the irrational claims that these things save lives because they break apart at impact. Also frustrated by such claims? Please offer your stories in the comment section. Yes! thank you Brad. Such statistics show at the population level how damaging misguided beliefs like this can be. Which country are you from? I'm assuming it's either Australia or New Zealand. British Columbia, Canada. We were the first province to enact an all ages helmet law and we did so with precious little evidence of what would happen if we did. The only "study" used to back up the stated claim that there would be a "undeniable, massive" drop in cycling deaths was the (since discredited) TRT, Seattle area study (that involved not a single case of motorist/cyclist collision) which claimed an 85/88% reductions in head/brain injury. Not a single member of the legislature read the study, they simply believed it would translate to real life circumstances in the province. Yeah, BC is a sad, sad story. And like Australia, you guys have such a strong bicycle advocacy culture. It's just up against this mythical barricade that can't seem to be torn down with logic. Keep reading, keep posting, and keep shouting. Maybe if enough level-headed folks get on board you can storm that barricade of a ridiculous law and tear it to shreds. Unfortunately, at the time, our advocacy groups were split on the issue and ultimately didn't oppose the proposed law because they didn't want to lose government support for aid in other bicycle related funding. Our advocacy groups lost about half its membership after the law was passed and what remained were staunch supporters of the law. For years afterwards, if anyone questioned any aspect of the law,,they were bullied into submission. Lately there has been more support of opposition to the law and the official advocacy group is in opposition to it but they still will not actively campaign for review of or a change to it. The upside is helmet law enforcement is generally lax and about half of people riding bicycles do so sans-lid. Personally, I stopped wearing a helmet 8 years ago and have yet to receive a ticket. Only once was I pulled over and questioned about why I wasn't wearing a helmet by a po (I was certain I was going to receive a ticket when he pulled me over) but after answering all the (young) officers questions (he clearly had never heard the information I was giving him and was obviously surprised with what he heard) his (older) partner approached us and said I could leave. But her in lies the rub, I had to walk my bicycle until I was out of their sight before I could get on it without a helmet on. In other words, people are forbidden from riding bicycles without helmets even though it is a proven fact people riding bicycles with helmets provide net benefits to not only themselves, but to society as a whole. And just having that ridiculous law in place creates a negative backdrop of dangerizing bicycling as it presents a means for police to harass helmet-less cyclists. Bad, bad law! Another positive of the law - it's generated a lot of discussion and a fair bit of press about it. The lack of a drop in deaths to cyclists, serious injury, and head injuries weren't the only failures in its explicitly stated purpose, there has been a much slower rise in helmet use as well. Perhaps this has been due to the general discussion of the realities of helmet use, I can't say for sure, but it was thought and hoped that the pre-law usage rate of about 43% would be doubled because of the law. Almost 20 years post law helmet use is about 55%. Oregon has a higher rate of use without a law. Thanks Brad. It's great to see these details and your personal insight regarding the BC law. As a friend of mine likes to say about things that frustrate me, at least it can be a bad example for us to point to. There are a few flaws in your argument. I have been cycling for 54 years. 12 years racing, including A grade road racing. I have seen and experienced serious accidents. Accidents involving motor vehicles predominately involve broken limbs and internal injuries. And yes its likely that a helmet won't reduce the injury much. However most bicycle accidents do mot involve motor vehicles. They involve other bicycles, pedestrians, dogs, poor riding skills, loose surfaces. About speed... most bicycle accidents involve heavy contact with the pavement. The head hitting the ground will not do so any quicker, regardless of the forward speed. its vertical speed that counts, and that is due to gravity, which is constant. From 2m height the vertical speed achieved is similar to the test speeds. 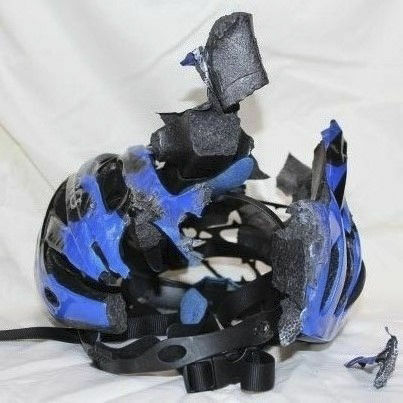 About helmet failure..... the destruction of the helmet absorbs energy over tens or hundreds of milliseconds. ANY extension of the time taken to decelerate the brain within the skull, within the helmet will reduce the likelihood or severity of brain damage. Its basic physics, energy absorption and time extension reduce G forces. Reported accident rates and injury rates cannot be used as reliable data. Most bicycle accidents that would otherwise have resulted in injury, but because of a helmet being worn, did not result in injury, DO NOT GET REPORTED. Personal experience tells me very clearly that helmets DO reduce head injury. Whenever I see a cyclist, skater or skateboarder without a helmet, I think to myself... "obviously doesn't have enough brain to worry about injuring it!" Hi Bob, unfortunately the best studies of supposed helmet absorption to slow the brain hitting the skull do not come from the bicycling world - there have been no usable studies with bike helmets. But we can look at the NFL, as I note in my blog post, and those results clearly show that a helmet cannot and does not prevent brain injury. Also, while you're correct that many bike crashes happen at less than 13mph, your statement that impact speed does not increase with the speed of the cyclist is misleading. Of course impact speed includes the speed of the cyclist and it is quite easy to top 13mph on a bike. And adding the impact of another moving object such as a car also adds to that impact speed. That's why so many bike helmets are cracked and broken in crashes - they hit at more than 13mph. For your final note, I hope you keep that to yourself. Chiding people who choose to ride without a helmet only adds to the harm that helmet misinformation is doing to efforts to bring more people to bicycling. I hear you, and am completely in agreement with you that MHL is stupid, but if I were to play devils advocate regarding your suppositions above, I'd point out that your comparisons between helmets and lifejackets/seatbelts is poor. A better comparison would be car crumple zones. Similarly, it is the crumpling of the foam that tries to reduce the effect of your brain bouncing around in your skull. As I said, I'm with you, but there are some poor arguments above. Thanks Inertia. By the way, I removed your second comment as it looked exactly the same as this one. Regarding your concern, consider that seat belts are still required even as car zones crumple. If crumple zones did what people believe bike helmets to do (protect the mobile object within the covered shell), then they would remove the need for seat belts. Unfortunately, there is no way to put a seat belt on our brain. I would add the comparison is fair. As far as I understand, seat belts and life jackets do a much better job of working than bicycle helmets. Exactly. Otherwise, we could just wear bits of broken helmet on our head for protection. The CPSC and other bike helmet tests look for cracks and breakage at point of failure. As long as they don't crack below 13mph impact speed they pass. Cracks after that, no problem because regulations don't require them to withstand blows at higher speeds. And with customers pointing to cracks and breakage as proof of quality, all the better. Rubbish..... The energy absorbed, and G force reduction, during failure is significant. The failure is the result of the crushing going beyond the limit of the material. Obviously, once broken it should not be reused. No-one suggested that a broken helmet offers protection. Unfortunately, many, many people are suggesting that broken bike helmets offer protection. That is the point of this blog post. And since the maximum force a helmet can provide protection from is one equivalent to a simple fall from a standing height before it breaks apart, the suggestion that a broken helmet has saved a life suggests that that type of fall most often results in death. This we know is not true otherwise people who have simple falls without helmets on (almost everyone in life) would be dying. Sue, if Australia had a strong bicycle advocacy culture, we probably wouldn't have helmet laws. It's because our advocates rolled over and submitted - and continue to submit to helmet promotion - that we still have the stupid laws. True, James. Though perhaps we can point to a need for more education on this topic. I still appreciate the efforts of many Australian bicycle advocacy initiatives. But you're absolutely right that fighting for a great initiative at the same time one is pushing bike helmets pretty much cancels out the good work. Dear Sue, So wearing a helmet reduces and or absorbed some of the initial impact force, reducing the severity of the head injery, but not always stopping all injuries? Correct? I would without any question use my helmet every time i go out on the bike if you answered yes. Oh thats right i do. Please move on from this boring topic. Helmets can't save every life of prevent every type of injery but if they do reduce some form of injery or absorb some amount of impact force then thats good for me. P.s. seat belts dont save every motor vehicle accident but they do seem to reduce the amount of injery. Hi James, looks like your second comment was a repeat of this so I removed it. A bike helmet is a sphere of foam. Depending on the crash, it might prevent some scrapes and cuts, though it will never prevent brain injury. But if the total impact speed of that crash is more than 13mph, that bit of foam will break and will not offer you any protection. If you are concerned about crashing at 13mph or less and wearing a bike helmet will keep you riding a bike, yeah definitely wear a helmet. But don't pretend that a bike helmet will protect you at faster impact speeds than that and never expect it to prevent brain injury at any speed. Also keep in mind the potential of rotational brain injury caused by the helmet in a crash. Know the limits and dangers of wearing a bike helmet before you make such ultimatums. I'm sorry to hear this, Wilma. I hope this blog and others who are fed up with this problem can help you repeal that law. Hi this topic is close to my heart. Having lived in BC and mostly loved it I can say that the ridiculous nanny-ing not so much from the state cause the cops never bothered me but from individuals for not wearing a bike helmet was one of the few things I don't miss about Vancouver. That said Toronto doesn't have helmet laws but we have at least as many anti-science do gooders as on the west coast. For all the helmet evangelists I suggest you do some research on the efficacy of bike helmets. Here's a pretty decent CBC article that flat out states, in a quote from Toronto neurosurgeon Charles Tator. that bike helmets have not protective benefit against concussions. Further some of these links are no longer valid but here is a list of research pro and mostly con re the efficacy of helmets and the legitimacy of helmet laws/shaming. Thanks, I needed to vent on this, I was denied membership in a social, read casual, bike club because I don't wear a helmet. I'm thinking about a Charter of Rights violation case but need to read up a little more on that law. Thanks for venting Alex. Good stuff. I'm sorry you are having such a hard time as a helmet-free rider. But keep at it. This information must become as pervasive as the misinformation has become. If you are told that helmets are life-saving, and you experience a crash, where your helmet gets an impact, it is only logical that you claim that the helmet saved your life. The best response you can give as a bicycle advocate (as well as any other sort basically empathetic human being) is to say "lucky you". It may be true, it may not, but you should at least meet any person where he or she is, that is to respect and accept what he or she feels about his or her experience. Having done that it is reasonable to discuss to which extent the experience can be generalized. An enormous amount of studies and reports exist, pointing in all possible directions. When it comes to real "before-after evidence", the number of studies is however very limited. I know on two (form Australia and Sweden), both concluding that it is not possible to find the predicted reduction of head injuries among cyclists when helmet wearing rates increase substantially after helmets laws. So even though you may feel yourself that the helmet saved your life, this seems not to be the general case. Great article, Sue, thank you for tackling this specific issue (when people claim a helmet saved their life). Living in Australia, my decision to no longer wear a helmet was difficult, but I don't regret it one bit. I was brainwashed in the late 1980s by the advertising blitz that accompanied the introduction of the helmet laws. As a result I had some sort of blind faith that the helmet would look after me - that it was preventing me from getting injured. No longer am I a blind to the dangers. I now cycle fully aware of my vulnerability and take far fewer risks as a result. I ride a lot slower, with far greater safety buffers around me; I work hard to avoid sharing the road with cars; at all times I try to be able to stop within a few metres. I feel so much safer now that I no longer wear a helmet. Very interesting. In fact, these false claims about bike helmets cause many, many harmful effects that keep bicycle advocacy efforts from succeeding. Your point about riding dangerously because of over confidence in bike helmets is just one. By the way, I absolutely empathize with the brainwashing. As you can read in my first post on this blog http://www.bikehelmetblog.com/2015/05/welcome-to-bike-helmet-blog.html I actually used to scare my bike shop customers into buying a bike helmet. This horrifies me to this day. But at least it prevents me from getting angry at people who still believe in false super powers of bike helmets so I can focus my energy on getting the truth out. Lots more to come via this blog! Thanks for reading and engaging in it. I think the issue is that there has been no crash testing to see if helmets have an effect. For example take a crash test dummy from the auto industry, attach it to a bicycle, put it into a crash, repeat with and without a helmet. Use the more then 40 years of car crash data to determine injury rates. Do this for the 4 or 5 different crash scenarios, that are most common. (rear wheel Wipeout, fall over, hit solid object (stationary) hit solid object (moving), front wheel rotational stall. 5) Reduced head injury, increased injury to another part of body. The huge benefit with this, is that it would result in better helmet designs. Great idea! Though I would emphasize that much clearer result criteria would be necessary, including defining "injury." When people claim their helmet saved their life, they are imagining protection of their brain. Injury to the brain must be measured. This is why the melodramatic bike helmet demo of dropping a melon with and without a helmet is bogus. For one thing, the speed is under 13mph. Also, our skulls are far stronger than a melon skin. But more importantly, a melon does not have a moving, vulnerable object inside of it. Also, note that "head injury" includes scrapes and bruises to any part of the head. Even a tooth injury can be classified as a head injury. This fact alone skews the head injury data wildly. One other detail to keep in mind is that people often buy bike helmets believing that they will protect them in a crash with a motor vehicle. A test like this must include car/bike collisions. So if such a test were to be run, those running it would have to have an extensive knowledge of this issue, otherwise we'd end up with yet another biased show and tell. By the way, I did send this suggestion in to the MythBusters TV show about a year ago. Unfortunately, they ignored it. I guess some myths have too many believers even for them. Your post is full of misunderstandings and misrepresentations. "What other safety devices do people hold to such a low standard? If I life jacket tore apart and floated away as soon as you hit the water, would you claim that it saved your life? If a seat belt released upon impact, would this bring it accolades?" Your examples are nonsense. A life jacket is supposed to make you float. A seat belt is supposed to prevent you from being thrown forward. Do you know what a bike helmet is actually supposed to do? It's supposed to absorb energy from an impact and prevent it from being transferred directly to the head. Crumple zones in cars perform a similar function. If you have a major impact, and your car doesn't crumple, you'll probably be dead. If it does crumple you might get away with a less serious injury. You could point to your thoroughly crushed car and legitimately say that it saved your life. A helmet which didn't break or distort in a severe impact would instead transfer energy directly to the head. Is that what you think it should do? "In fact, bike helmet manufacturers brazenly admit how fragile their helmets are – if you drop your bike helmet, the warranty is void and you must replace it." I checked as many bike helmet guarantees as I could find online, and I found none which said anything like this. "They are, after all, just a bit of Styrofoam." True, and banal. A book is just a lot of sheets of paper. The air is just a gas made mostly of nitrogen. I don't think you're letting anyone in on some big secret here. Expanded polystyrene foam has properties which make it a desirable material from which to make helmets. "They only need to test their helmets to a total impact velocity of 20 feet per second, which translates to 13.64 miles per hour (21.95 kilometers per hour). That’s about the same speed a head reaches when a person of average height falls over from a standstill." From the link you posted, this speed "typically means that the helmet must drop at least 6½ feet". A person of average height is not 6½ feet tall. You seek to imply that the test is passed if the helmet does not break on the impact. The test described is an impact attenuation test, and a helmet fails the test if any of the samples tested under any of the conditions described above shows a peak acceleration of more than 300g. Also, the test is a US test, not a global one. Cycle helmet standards that are not ideal in one part of the world do not imply that all cycle helmets everywhere are deficient. "Think about this. If you are in a crash of any speed whatsoever and your helmet breaks apart at the initial impact, your head is not only unprotected at impact, it remains so through the rest of the crash." In fact, by absorbing energy that would otherwise have been transferred directly to your head, the helmet was protecting your head at impact. This is quite obvious. Indeed, it can't protect your head after it's been broken. Not really a way around that, but it hardly argues against wearing a helmet in the first place. "The low impact speed for which bike helmets are designed is troubling enough. Then consider that the tests are also limited to the top parts of the helmets, never blows to the side or back. Take a close look at the diagrams in that CPSC link to see this. I suppose if crash victims could reorient themselves during a crash to ensure they only hit the top of their head, this could be useful, at very low speeds anyway." From the document you linked to: "Drop helmets 1 through 4 on the schedule above each a total of 4 times, twice on the flat anvil and twice on the hemispherical anvil.... Make sure that a different part of the helmet hits the anvil each time. This means that you must adjust the headform after each drop." "But then consider that bike helmets must be fitted perfectly to each wearer in order to be useful at all." "They come in at least eight sizes, depending on the manufacturer. Then, assuming you choose the correct size, you must spend time micro-adjusting the strap so the helmet sits just so on your head, otherwise there is no expectation for it to protect you at all. Here’s the result of a lawsuit won by a bike helmet manufacturer because the victim, an experienced cyclist, could not prove that he had adjusted the helmet straps correctly." "Some bike helmet manufacturers are trying to do the right thing by developing helmets that can withstand greater impact. The results are extremely expensive helmets that usually look a lot like motorcycle helmets. Are we really going to encourage more people to ride bikes if they have to wear a motorcycle helmet?" I never saw a bike helmet that looked remotely like a motorbike helmet. Got any examples? "All of this still doesn’t get at the larger issue – that no helmet, not even a motorcycle helmet, can prevent brain injury." Anything which reduces the acceleration of the brain inside the skull can prevent brain injury. People wear helmets in all sorts of situations for this reason. To deny the basic concept is pretty bizarre. "Nothing can prevent a brain from slamming into the inside of its skull." Replace "nothing" with "Any kind of padding" and you're basically correct. "After more than a decade of researching and discussing the bicycle helmet problem I’m more than frustrated with its significant harm to bicycle advocacy efforts. I tend to get a twitchy when I’m forced to listen to an impassioned proclamation that a bit of Styrofoam saved someone’s life. I’m ready for bike helmets to be seen as what they actually are – just a bit of Styrofoam, nothing more, nothing less. If someone feels better riding their bike with a bit of Styrofoam on their head, cool, go for it. But please, let’s stop the irrational claims that these things save lives because they break apart at impact." Again you seem to think that the material it's made of is your killer point. Bicycle helmets save lives because they reduce the acceleration of the head in impacts. That's not irrational. In fact, it's common sense. In particularly bad impacts, they might break. It's not the breakage but the reduction of acceleration that has the beneficial effect. If you don't want to wear something that will soften the blow in case of an impact while cycling, then cool, don't. But don't lie about, misrepresent and misinterpret the data to try to persuade others not to do so. That's what is truly irrational here. RW, I'm a bit at a loss as to why you find my post so scandalous. In fact, with just a few additional details, you and I seem to agree on most points. Crumple zones - please consider that people inside cars are still expected to wear seat belts. There is no way to seat belt our brains. Here is one helmet warranty that is void from dropping: http://au.nutcasehelmets.com/warranty/ . Others simply specify any damage. Many will replace them for free if you can prove you crashed, but most will not simply for dropping it. Regarding the test, I specified "top part" of the helmet. You'll note in this and other tests done around the world that bike helmets are never tested for direct blows to the side or back. If you find one that tests directly to the side or back (not vague language like "different part"), please post it here. We actually agree on the result of the lawsuit - the victim could not prove that he'd adjusted his helmet correctly. That was my point. And finally, if you know of an unbiased study that proves that bicycle helmets reduce the acceleration of the brain, please post it here. Your own initial blog post would make a good submission in itself. BTW, I found posting on your comments a bit difficult. I'm used to being able to use facebook or an email to enter comments on online forums. Thanks Kathy. Great news about the extension and that submissions are rolling in. Would you mind posting that link to the comments section of the article about that effort on this blog? It's still attracting more readers and I'm sure they'll like to know they still have a chance to submit their thoughts. I didn't say I found your post scandalous except for one point where you were clearly dishonest. I said that you misrepresented and misunderstood various facts. But you've misrepresented and misunderstood my points. I should have expected that I suppose. You missed the point about crumple zones. The fact that they crumple is what makes them a safety feature. They absorb energy. But you were arguing that anything that breaks or deforms on impact is a failure. You are wrong. "There is no way to seat belt our brains" - how very sad that would be, if true. But if you want to reduce the acceleration of your brain inside your skull after an impact, wear a helmet or otherwise pad your head. Skateboarders know this. Skiers know it. Motorcyclists know it. Many cyclists know it too. Apparently, you don't. "different part" is not vague language. You falsely claimed that only the top part of the helmet is tested. That is not true. "We actually agree on the result of the lawsuit - the victim could not prove that he'd adjusted his helmet correctly. That was my point." No, we don't, and your misrepresentation of what I said and what the lawsuit found is immature. The victim would never have to prove that he'd adjusted his helmet correctly, because that would be impossible. The helmet manufacturer in fact proved that he was wearing his helmet incorrectly. That is a very different thing. Do you understand the difference? Seems like you really don't understand cycling, or else you're trying to fool gullible readers again. Downhill helmets are for downhill biking, in which the risk of crashing is high and facial protection is highly desirable. No-one uses or advocates using downhill helmets for road cycling. I suspect that you would consider any study that proves you wrong to be biased. So, before I point out some relevant literature, define clearly what criteria you use to decide whether a study is biased or not. Crumple zone comparison only works with bike helmets up to 13mph. When they break they are not absorbing anything. Even up to 13mph, cannot prevent brain damage. Studies to find - Proves that bike helmet slows acceleration of brain. Bike helmet tests to find - directly to side and back. Either you fundamentally don't understand physics, or you're simply not interested at all in whether what you say is true or false. I am still in hospital after being hit by a truck. I had blood on the brain, concussion, major fractures etc. I have come to the conclusion that I probably do need to wear a helmet in Australia for the type of journey I was on - urban, potentially dangerous. Does this require a compulsory HL though ? No. Well put. Thank you. And good luck with your recovery. Once you're back on your bike, keep in mind the limited protection a bike helmet will offer. I hope someday soon Australia will shift their bike policy efforts away from helmets and into improving roadways so you won't have to ride in potentially dangerous situations. Sue I absolutely support your honourable aims here. I totally agree that helmets breaking up on impact is not a good thing. And nor is a helmet law the solution. Helmets are just one form of protection, that will only help in very specific circumstances. However where I do have a problem with what you are saying is that you are completely wrong where you say that helmets don't reduce the acceleration of your brain, or that they are only tested on the top. To describe the mechanics of impact induced brain injury, I use the analogy of a jelly within a glass bowl. If you slam that bowl sideways into something, the jelly does slump towards the impact, and if the impact is hard enough, you'll find the worst damage to the jelly is at the back, where it tears away from the bowl. Imagine then that you have two bowls travelling at the same speed. One slams into a brick wall stopping dead and the other lands in a nice soft cushiony pillow. Which jelly will be more badly damaged? I have been involved in a lot of cycle helmet testing as we have been designing a helmet to try and overcome some of these issues such as breaking apart on one hit, poor fit etc. We have carried out nearly 2000 tests on various Prototype and material samples including EPS. I have seen an awful lot of data - and it clearly shows that, at the speeds specified in the tests, a head with no impact absorbing material will experience up to around 2000g deceleration. Just 25mm of EPS reduces the head deceleration to around 180g - 200g. Can your brain survive 200g? Yes if you're lucky. It will probably be damaged, but can survive. Can it survive 2000g? No. Secondly in fact if you talk to the professionals about this, you'll find out that they do in fact test helmets all over, on the sides, back etc (within the areas above the lines specified in the standard). Certainly EN1078 states that the tester should select any area that looks weak. So again, I am afraid you're wrong saying that they only test the top. So whilst I agree that current helmets and the safety standards have their shortcomings (we're working to try and solve that), spreading confusion about the physics and testing methods is not going to help people either. And for the record I commute by bike to work every day. Having seen what a head slamming into something at 20mph looks and sounds like, I now always wear a helmet if I can. BUT I will also try and cycle as safely as I can, because the helmet will only help my head out a bit and it won't protect my internal organs, limbs etc. Whilst we're working to improve the safety of helmets, I know that's a stop gap. What I'd really like is for the roads to be safer... something I think we all agree on. I very much appreciate how you have placed your viewpoint in context here. Even as a bike helmet tester you caution against relying on helmets for safety. That's a refreshing change from most helmet manufacturers who stay interestingly quiet as people project fictional expectations onto their product. I still have to defend my claims, though. Your analogy of the jelly doesn't coincide with a brain. There is actually a space between the brain and the skull so there can be damage at both ends. More importantly, most bicycle helmets are manufactured to the minimum requirements and that is why they break at about 13mph impact, at which point they offer zero protection. The question to ask is whether an unhelmeted head would experience brain damage below that speed of impact, including whether the head would have hit at all without the helmet’s added weight and diameter. A laboratory test would not include human instinct. The smallest babies learn how to fall without hitting their head. If we fall from a standstill so that our head would impact the ground at the approximate maximum impact speed that most bicycle helmets are designed for, we will bend our neck to avoid our head hitting. We do this in any crash. But the added weight and diameter of the helmet throws off this natural protection. Have your studies included these factors? Perhaps the most important point is the vast gap between what people expect from their bicycle helmet and the protection that helmet actually offers. You note that some manufacturers go beyond the CPSC requirements of testing the top only. Such exceptions are not what I'm talking about. Most bicycle helmet manufacturers simply test to the minimum and design to that minimum. And even if they were to test further, in order to create a helmet that protects the entire head and does not break at 13mph or even your personal line of 20mph, the cost of such a helmet would far exceed the amount most people would pay for one. And that helmet would still not PREVENT brain damage. It would also look rather like a motorcycle helmet. We cannot expect to encourage most people to ride a bike if we say they must wear a helmet in order to do so. To tell people to wear a bicycle helmet, any bicycle helmet, in order to "be safe" or to "protect their brain" gives the false impression that any bicycle helmet will prevent brain damage in any crash no matter the speed of impact. If we were to change that message to be closer to the truth and say that they should only ride a bike if they wear this specific helmet that looks like a motorcycle helmet that will protect their skull and perhaps prevent some brain damage up to a total impact speed of say 15mph, does such a message solve the problem with bicycle helmets? Then consider that bicycling is one of the least likely ways a person can sustain a head injury. Car occupants are far more likely to sustain a head injury - see the graph posted on this page: http://www.onestreet.org/resources-for-increasing-bicycling/136-bicycle-helmets . Let's start asking why bicycling has been singled out for fanciful stories of heads splitting open that can only be done with a bit of foam stuck to the head, when riding in a car is far more dangerous and walking is equally as dangerous. No one yells at car occupants or pedestrians demanding to know where their helmet is. But helmetless cyclists are frequently harassed in this way. I applaud your ability to put your work in context. I hope you can also help your colleagues to start speaking up when their products are placed on false pedestals of magical protection. This will contribute to bicycle helmets finally being seen by most people as providing the very limited protection they do. From there we can shift our messaging about riding bikes so that bicycling will finally be presented as a means of moving about as natural and safe as walking. http://www.cbc.ca/news/health/bike-helmets-should-address-concussion-risk-scientists-say-1.1367454 . Further you have not in any way addressed the need for bicycle helmets as opposed to walking or car helmets when the rate of head injuries per unit of time for both of those activities is pretty much equal to that of bicycling. One question I do have ask you is whether you work for a bicycle helmet manufacturer or in any other way are financially compensated directly or indirectly from the sale of bicycle helmets? Thanks Alex. I assume from your earlier comments that this latest one is not directed at me. If you would like your question answered by a particular commenter, maybe include their name or repost this as a reply to their comment. Sue>> It was in fact a reply to Andrew Redman's comment above, and I'll try to remember to specify my responses going forward. Thanks as well for the onestreet.org link, it's another excellent resource for factual information re bicycle helmets and I've bookmarked it for future debates. I have one other question for you, I'm assuming that Australia like here in Canada has a charter of Rights and Freedoms. Has anyone challenged the bicycle helmet law, (or in my case here bike club policy)as being discriminatory exclusion based on the "arbitrary and capricious" argument? In US law arbitrary and capricious means that there is "an absence of a rational connection between the facts found and the choice made" http://definitions.uslegal.com/a/arbitrary-and-capricious/. If a case based on that argument made it to a higher court a full accounting of the research for and against helmet efficacy would be made part of the public record and hopefully a sound judgement would prevail. That sounds interesting. Have you tried this in Canada? For Australia, the best organization to start with would be Freestyle Cyclists: http://www.freestylecyclists.org/. While lots of smaller groups around the country are also fighting their helmet law, Freestyle is entirely focused on this issue and shifting views of cycling back to a normal activity. Let me know if you or they give this interesting angle a try. I nicked your broken helmet image, I hope you don't mind. Glad you like this one. Your use of the image is a different topic, though and may detract from this one. I wonder if viewers will flip it and imagine that bicycling is horribly dangerous because drivers are indeed talking on their phone and therefore run over ever cyclist on the road. Just my thought.